Posted on May 28, 2010 by strawberry | Enter your password to view comments. Today was a day I’d been dreading for ages. Curly had his state mandated lead screening blood draw. Strawberry and I went together to the lab, and thank goodness we had an appointment! The waiting room was very crowded and Curly was already restless after 5 minutes. Fortunately, we were called back in another 5. They informed us that it would indeed need to be an inner arm draw, but that we could hold him on our laps and that they had baby needles. As you may guess, Strawberry did the holding and I cowered in a chair across the room NOT LOOKING. He screamed in shock and pain for the minute or so that it took and then was easily calmed with his thumb and a few sips of juice. Oh, and a sticker. Which he proceed to eat. He didn’t struggle at all and we are so proud of him and relieved that it’s over. Going back to a topic we’d mentioned before, Curly is 2 weeks out from his MMR vaccine and the only side effect was waking in the night for a few nights immediately following. Which we are 100% sure was from the shot, since it’s so very out of character for him. Perhaps his body was busy fighting off the effects of the vaccine and that disturbed his sleep. He’s been fine ever since. In happier news, we finally got around to having a professional photo shoot. We’ve been kicking ourselves looking at other people’s adorable baby shots, since we never did any. But at least we now have shots of Curlyat 1 year. We purchased a 1 hour on-location session with a local photographer and met at a park with a well maintained shade garden. No flowers (the azaleas were past peak and looking sad). Lots of winding paths, soft grass and undergrowth. Benches and gazebos. And billions of gnats. They loved my hairspray. But other than that, and a very cranky Curlyafter the first 20 minutes, we had fun and got some terrific shots. Here’s a teaser, we’ll share the rest in a password protected post. And in the happiest news of all.. Happy Birthday to my wonderful wife (and a few other fantastic Geminis in blogland). I love you with all my heart. Although we are not as brave as the traveling ladies over at Puffer and the Baby Fishes or Next in Line, we do love to get away. So when one of the cruise lines we’ve sailed with in our pre-Curly days announced a sale, we got bit hard by that pesky travel bug. And so it happens that all 3 of us will be sharing an interior cabin for 12 days as we sail the Caribbean in December. It was too good a deal to pass up, as the ship sails from a city within driving distance of us, thus there will be no air travel involved. Originally, we were looking to fly somewhere warm within the US and stay for a week, but once we added up the travel, car rental, lodging, and meal costs involved, we realized that a cruise would be about the same. We are both excited and wary about this trip. Cruising with a toddler and cruising as a couple are very different. Our schedule will revolve around Curly and his needs. There will be no more dinners at 8:30 followed by a show at 10 and drinks and dancing until 2 unless it also involves the ship board babysitter who charges by the hour. And no matter how dark the room, how gently we are rocked by the ship and lulled to sleep by the hum of the engines, the days of sleeping in until 11 are gone. Now our days in port will take into account nap time and when looking at excursions we have to check age restrictions. That said, we are looking forward to a warm getaway just as the winter begins, and sharing some beautiful beaches and turquoise waters with Curly. But the midnight chocolate buffet will be just for the moms! Posted on May 18, 2010 by strawberry | Enter your password to view comments. It’s no secret that I’m needle phobic. I’m 1000% better than I used to be. I can psyche myself up for shots and behave reasonably well. I’ve developed coping techniques (visualization, meditation, deep breathing, chocolate) over the years. This is far less effective with blood draws and IV’s. Along this line, I cannot watch anything involving needles without feeling like I’m going to faint. I do not watch the actual shot when Curly gets one. I was hospitalized for the first 10 days of my life with who knows how many needle sticks in that stay, so I think there’s a fairly clear-cut cause for my phobia. It’s completely illogical to assume that Curly will share it. And yet.. since his MMR vaccine on Tuesday, Curly has developed a new and unwelcome habit. In the dead of night, without any provocation or disturbance, he screams at the top of his lungs and burst into tears. He is easily soothed with a quick cuddle and when placed back in the crib he falls asleep again. Since he’s calmed easily we can rule out night terrors. It would seem that it’s either a nightmare or something physical. The injection site is not swollen or red, it doesn’t bother him during the day, he’s not feverish, and he doesn’t seem to be teething at the moment. I’d certainly be happier with him NOT waking up crying in the middle of the night. Ooh, boy does this confluence of events trigger some bad mommy/ mama bear instincts. I want to protect him and keep him safe. To me, shots and blood draws and the like are irrationally horrible. He’s due for 2 more shots in 6 weeks and we are supposed to get a blood draw for a lead test anytime now. And I am FREAKING OUT about it. He weighs 20 lbs, 12 oz and is about 31 inches long…putting him in the 20th percentile for weight and back up to the 75th percentile for height. We have a long, lean boy on our hands! The doctor checked out his eyes, ears, mouth, etc and declared him to be healthy (until the next daycare virus strikes that is). Then the tech came in to administer the MMR shot. It’s the first shot Curly got without the breast or bottle to comfort him afterwards…just some hugging from his moms and soothing words. He gave one of those huge soundless-at-first, red-faced screams, and then after one more scream, began sucking his thumb and calmed down quickly. We’re very proud of our big boy. We decided to delay the other two shots (last PCV dose and varicella) to be 6 weeks from now. The MMR can be a hard one, and we didn’t want him to deal with anything else right now. We’re both “working” from home the rest of the day so we can keep an eye on Curly, who is currently banging golf balls together and laughing at the dog. I got yer bullets right here..
Curly’s birthday party was a success. The weather was beautiful, nearly all of our invited guests made it from near and far, and Curly only got cranky for the last half hour, after which we took him home and he took a 2 hour nap. He loved his cupcake, playing with all his new toys, and being passed around. Whew. We got a free sample of size 3 Pampers cruisers with a Diapers.com order. We tried them on Curly and they fit. So it’s not our kid that’s the problem, it’s the sizing of the Nature’s Best diapers we use. Relief at not having some sort of giant or oddly shaped boy not readily detectable by us. As for the pampers, the purple color and branded characters I can deal with, but why do they have to be scented? Curly really dislikes standing and being in grass. 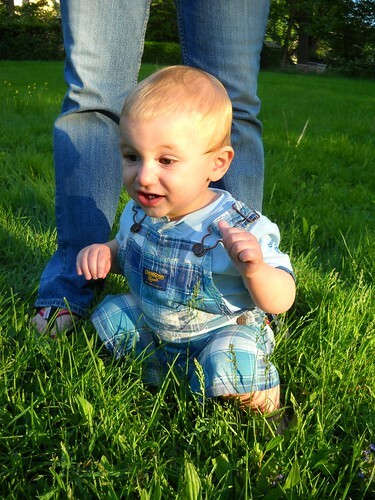 He will buckle his knees very quickly if you stand him up, and look positively miserable once seated in grass. On the plus side, we don’t have to worry about him crawling off when placed in a grassy area, which can be very convenient. 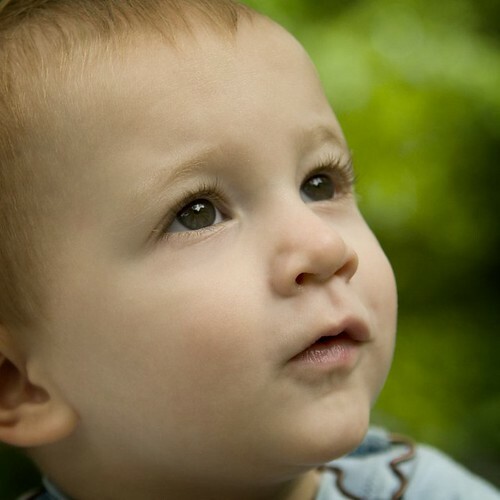 We are meeting up with Teaberry and her family, and get to meet baby Lucas for the first time tomorrow- yay! We have been interviewing daycare centers and found one yesterday that we absolutely adore. They should have a spot opening late this summer and we are so excited about it and crossing our fingers. Curly will be 15-16 months old and we think more than ready for a change of scenery. We would plan on keeping him there for the long run since they have a lovely pre-school program as well. The grass is HOT LAVA!